Day 2 of the Trofeo Princesa Sofia Iberostar regatta on Mallorca and again some lack of wind early this morning, but they got afloat as the sea breeze built to provide some decent conditions. Better day for the British Sailing Team members, with Giles Scott now just five points behind the flying Kiwi Andrew Maloney who has three race wins from four races. In the 49er Dylan Fletcher and Stuart BIithell sit one point behind new Aussie leaders Kurt Hansen and Simon Hoffman, while James Peters and Fynn Sterritt still carry a UFD down in 28th place. Hannah Mills and Eilidh McIntyre salvaged a third place in the 470, but Camille Lecointre and Aloise Retronaz of France are opening the gap in the lead. The women’s 49erFX is a very close series with Charlotte Dobson and Saskia Tidey tied for the lead with Alexandra Maloney and Molly Meech of New Zealand, and Brazil’s Martine Grael and Kahena Kunze just a point back. 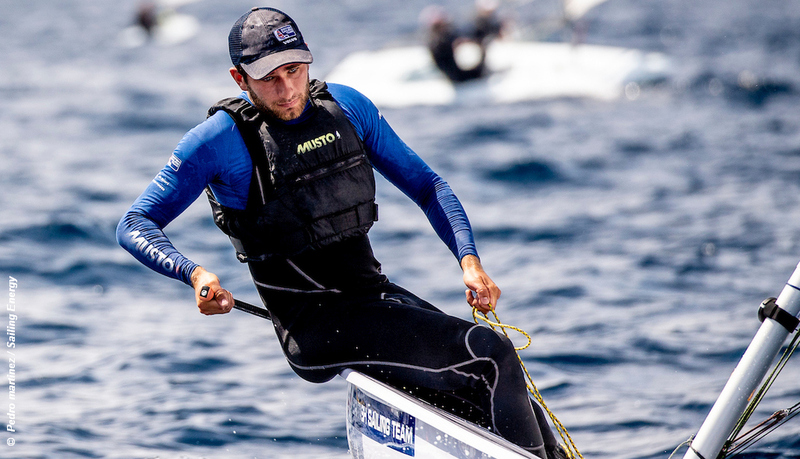 Lorenzo Chiavarini (image above) is the best placed British Laser sailor in fourth, with Hermann Tomasgaard of Norway holding a one point lead ahead of Ireland’s Finn Lynch. In the Radial, Denmark’s Anne-Marie Rindom has won all four of her races to lead from Maud Jayet of Switzerland. The RS:X got underway and Bryony Shaw finished two of the three races to place sixth behind overall leader Jie Du of China. In the men’s event Britain’s Andy Brown (image below) took his first senior race win and is fifth overall behind leader Mateo Sanz Lanz of Switzerland. – Race 3 – Flight race winners were Andrew Maloney and Josh Junior both NZL. Overall after 3 races: 1st NZL Andrew Maloney (4,1,1,1), 2nd GBR Giles Scott (13,1,2,5), 3rd NZL Josh Junior (1,7,1,16). Other GBR: 7th GBR Ed Wright (2,2,9,20), 28th Henry Wetherell. Three races completed today with Jie Du (5,3,1) CHN taking the lead, second Yue Tan (1,8,3) CHN, and third Siripon Kaewduangngam (2,15,2) THA. In 6th place is Britain’s Bryony Shaw (4,4,DNC). Three races for the men with Mateo Sanz Lanz (5,5,1) SUI taking the lead, second Michael Cheng (9,4,2) HKG and third Makoto Tomizawa (7,2,4) JPN. Britain’s Andy Brown (13,1,DNC) is in fifth place. Israel’s Yoav Cohen won hte first race but did not compete in races 2 and 3. The women’s 49erFX series added another three qualifier race for their flights. BRA Martine Grael and Kahena Kunze (7,6,1,1,9,6). Britain’s Sophie Weguelin and Sophie Ainsworth (17,4,6,185,4) in 10th. In the women’s 470, racing as one fleet, two more races see Camille Lecointre and Aloise Retronaz (13,1,2,2) of France have a 7 point lead. Elena Berta and Bianca Caruso (6,5,29,1) of Italy are second, tied on points with Britain’s Hannah Mills and Eilidh McIntyre (3,4,5,12). Britain’s Amy Seabright and Anna Carpenter are 30th. In the men’s 470, racing in two flights, two more races completed Tuesday . . .
– Overall after 4 races – 1st ESP Jordi Xammer and Nicolas Rodriguez (1,2,15,1), 2nd AUT David Bargeher and Lukas Mahr (2,21,3,3), 3rd JPN Keiju Okada and Jumpei Hokazono (1,5,5,4). Britain’s Luke Patience and Chris Grube (9,6,13,5) are 12th, Martin Wrigley and James Taylor (7,9,13,20) are 24th. Racing underway for the first 49er qualifying races, split in three flights due to number of entries (108). – Overall after 3 races – 1st AUS Kurt Hansen and Simon Hoffman, 2nd GBR Dylan Fletcher and Stuart BIithell (3,3,1), 3rd POL Dominik Busak and Szymon Wierzbickiy (4,1,11). Other GBR: 28th James Peters and Fynn Sterritt (UFD,7,8), 34th Jack Hawkins and Christopher Thomas, 50th Chris Taylor and Samuel Batten. – Race 3 completed, winners were Anne-Marie Rindom DEN and Maud Jayet SUI. – Race 4 completed, winners were Anne-Marie Rindom DEN and Tuula Tenkanen FIN. GBR: 21st Georgina Povall (25,9,7,15), 27th Alison Young (35,15,19,4), 37th Hannah Snellgrove (28,5,23,17). Other GBR: 12th is Nick Thompson, 24th Elliot Hanson. The Nacra 17 managed another three races for their two flights, overall leaders are Ruggero Tita and Caterina Banti of Italy. Second are Gemma Jones and Jason Saunders of New Zealand and in third place are Germany’s Paul Kohlhoff and Alica Stuhlemmer. Britain’s Ben Saxton and Nicola Boniface (5,3,5,1,9,11) are sixth, and John Gimson and Anna Burnet (16,4,5,1,7,8) are 8th.